There are in Lebanon currently about 1.2 million Syrian refugees. In the Beqaa valley, between Damascus and Beirut, there are many camps, sometimes no larger than 100 people. Before the war they came to Beqaa to work as seasonal laborers in agriculture. Now they are refugees in the same Beqaa and cannot go back to Syria. True to his unique camera style, Leonard Retel Helmrich delved into the lives of the people in camp by living among them as one of them for a year and a half. He shows what daily life is like for those whose lives are postponed. He shows how they adapt to their seemingly hopeless circumstances and through their resilience are able to find hope and enjoy life. Leonard Retel Helmrich is a Dutch cinematographer and film director of Indo descent. Received highest honours for international documentaries at the Sundance Festival and was the first two-time International Documentary winner at the Amsterdam Film Festival.Helmrich is famous for perfecting the ‘Single Camera Shot’ filming style and his related technical camera innovations. Born in the Netherlands to a Dutch father and a Javanese mother. Helmrich graduated from the Netherlands Film and Television Academy in 1986 and made his feature debut with the fiction film The Phoenix Mystery (1990). He began traveling to Indonesia shortly after the death of his mother in 1990 and now splits his time between Jakarta and Amsterdam. 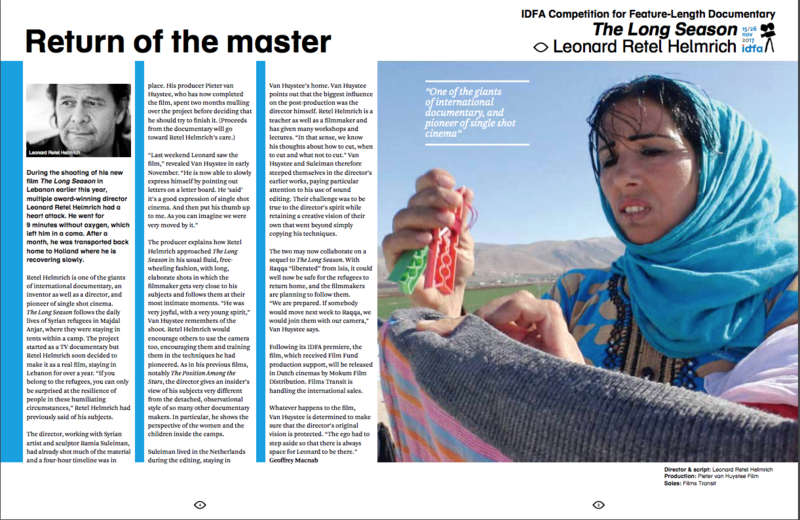 Article about film, director and producer, published in 2017 IDFA guide.